We went to an event last night at the Burnaby Hilton for the PROJECT EMPTY BOWL to fight local hunger and poverty. It is the 8th year it's ran and they raised 30k$! It is still small and to be honest, I thought it was rather poorly advertised. I only found it two years ago when I first moved here when I was scavenging for Vancouver food events. There were gnoshing food stations and silent auctions. The restaurants serving were: the award winning, Bocuse d'Or representing, the Pear Tree, Hart House, Horizons, Hilton Restaurant, Valley Bakery. The food was wonderful. I particularly enjoyed the Horizons Restaurant station. The Pear Tree was nice as well but it was easily the most inefficient station I have ever seen. Have you ever seen the next best chef or the next Food Network star when one of the challenges is one of these charity or appetiser evenings? Timing is a factor. The Pear tree had two dishes. The tune was delicious, perfectly seared though lacking a bit in flavour. The second was a pea ravioli on some diced root veg. It was unbelievably poorly planned. The line up was long and crawled. The chef would sautee for 5-10 minutes some zuccini and other tiny diced veg for several minutes while boiling a half dozen ravioli. The dish is served with the ravioli served on the veg. He would only serve the fully plated dish and only start the next round once he had completely finished plating all the ravioli. It was astonishing. I got one near the beginning so I did not wait in line. D was not as fortunate. It was delicious. Really. Much better than the tuna. Though, I will say, having had it, I would not have recommended waiting in a 15 minute line for it. It was just 1 ravioli! Horizons had two seafood dishes. Yay! One was an fantastic, huge, luscious, perfectly seared scalloped on some chopped tomatoes and some rocket. The second was a beautiful, well, plated mini dinner. It was a smoked troute on a bed of new potatoes and green beens. Wonderful. Seriously will need to book a visit to this restaurant. They were highly efficient as a station. There was rarely anyone waiting. They always had portions of their plating on the go, in the process so has not to be bottlenecked along the way, without sacrificing quality. 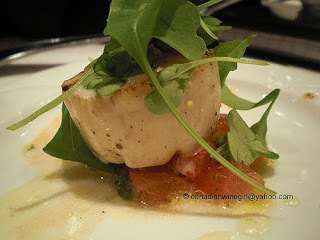 Hilton, I had, unfairly, the lowest expectation for the host hotel's own restaurant. I was wrong. They had to simple yet elegant dishes served with care and pride. 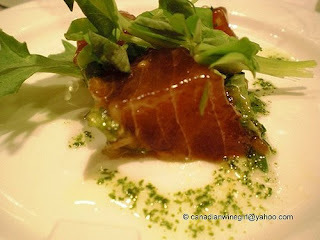 The first was an easy easy but very yummy tuna tartar salad in sesame and soy served with greens. The second was a seared sliced steak served on what I think was a saffron risotto (I didn't take notes) with addictive carmelised onions. Just great. I didn't have the steak, just the rice and the onions and they happily plated it without the meat. D did and he thought it was well cooked and to temperature. The Harthouse station was friendly and delicious. Horizons where a bit standoffish as a cooking team. Heads down. But the Harthouse station were smiles and serving with cheeky pride. They were happy to plate their yummy mash with beans without the large piece of braised porkbelly and cinnamon foam. D liked it quite a lot. We both loved their second dish. 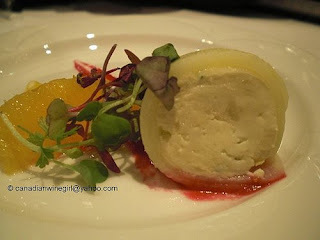 it was a goat cheese roulade. The roll was thinly sliced potato and it was served on a smear of beet puree. Wonderful! We've eaten there in the past but with it way out in the far end of Burnaby from town, it's rather an event to go. Their food is wonderful. The final was the dessert station. Valley Bakery served cream puffs. The cream was fresh and had a touch of orange essence. Tasty but rather simple and a shame that that there wasn't more variety. They simply served one, two or three to a plate. There was no other dessert station. Shame. There are alot of lovely bakeries and chocolatiers who could have volunteered.